I plan to do real reviews next month, but I have been remiss in not at least mentioning before now that two of my favorite websites have spawned dead-tree progeny, i.e., books. If I were allowed to regularly read only ten websites (indulge my apocalyptic (for the moment) fantasy here), Language Log would definitely make the cut. A group blog written by a cast of witty and perceptive linguists, it manages somehow to be both consistently fascinating and often hilariously funny. 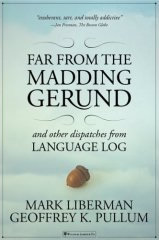 Now two of the site's stalwarts, Geoff Pullum and Mark Liberman, have produced a collection of LL's best, Far from the Madding Gerund and Other Dispatches from Language Log. I command you to buy it. Another one of my choices would be taken up by Grant Barrett's Double-Tongued Word Wrester site, which, in Grant's words, "... records undocumented or under-documented words from the fringes of English. 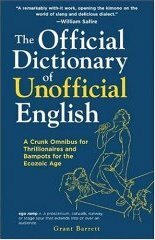 It focuses upon slang, jargon, and other niche categories which include new, foreign, hybrid, archaic, obsolete, and rare words." The Official Dictionary of Unofficial English is a collection of Grant's DTWW discoveries. Grant (link goes to his personal blog) is a lexicographer at Oxford University Press and project editor for The Historical Dictionary of American Slang, which was orphaned by the demise of the Random House reference division after just two volumes, but has been given new life by the great folks at Oxford. Anyway, you should also buy Grant's book. Onward. I keep forgetting to mention this, so I'll stick it here. For several years this site was produced with Microsoft FrontPage for Windows, which has a well-deserved reputation among web designers for butchering web pages with globs of deviant code. When I switched from Windows to Linux, I tried a few web page editors and settled on the Bluefish editor, which I have grown to love. It's not a wysiwyg editor, but that's a good thing in my book. One of the things that really annoyed me about FrontPage, incidentally, was that it refused to allow resizing the html editor screen text size. It's almost as if MS didn't want people writing their own code.... There is an OS X version of Bluefish, but Windows users are out of luck unless they use Cygwin. More to the point for folks using OS X or Windows, I spent several years paying for versions of Paintshop Pro in order to fiddle with the illustrations for these pages (resizing and setting transparency, mostly). But shortly before I dumped Windows, I discovered The GIMP (which stands for "GNU Image Manipulation Program"), a free and open source Photoshop-like program. Photoshop mavens point to the GIMP's shortcomings versus their fave, but for most of us it's a godsend, and, being a truly cross-platform application, it can be had in Windows, OS X and Unix/Linux versions. There's a bit of a learning curve to understanding the GIMP's interface, but there are some very good guides online. As always, the circus rolls on at da blog, where you will find, among other things, exciting coverage of the Millersport Sweet Corn Festival! Be sure to tie your kangaroo down first. Dear Word Detective: Many times a character in a book, play or scene, usually British, will refer to a horse racing enthusiast as being "fond of the gee-gees." As the words "horse," "racing" and "enthusiast" contain no "g"s (and neither do "racetrack," "paddock," "stable," "jockey" or "tout"), I am curious as to where we got this seemingly ridiculous expression. -- Tom. Oh boy, horsies. We love horsies around here, probably because we don't own one. Right after we moved to the country, somebody offered me a free horse. Fortunately, I did some quick checking and discovered that there is no such thing as a free horse, at least once you start counting food, housing, and vet bills. On the other hand, if the price of gasoline keeps going up, it may make sense to rent a couple of hayburners to ride to the supermarket. Or maybe just a really big one that can tow our car. I had never heard of horses being called "gee-gees," but once I started checking around, it made perfect sense. It all goes back to human beings' desire to give instructions to horses. Since horses, Mister Ed notwithstanding, have limited verbal skills, the commands had to be kept short. In England around the 16th century, the standard "calls to horses" were "ree" when you wanted the critter to turn right (possibly simply a form of the word "right") and "heck" or "hey" (later "haw") when a left turn was needed. Horses apparently found these "calls" easy to follow, although obedience was far from certain, leading to the colloquial phrase "neither heck nor ree" (meaning "to go neither left nor right") as a popular idiom meaning "to be obstinate." Apparently influenced by "ree," the order "gee" (possibly a form of "go") came into use as an order meaning "go forward" or "go faster," but in some locales "gee" also replaced "ree" as an order to turn right. If I were a horse, I'd have seriously considered starting a union at that point, but apparently everything was worked out and eventually "gee" and "haw" were pretty standard calls to horses in both the UK and the US. By the way, this "gee" is unrelated to our interjection "Gee! ", which is a euphemistic contraction of either "Jesus" or "Jerusalem," and is surprisingly recent, appearing first around 1895. Meanwhile, many small children had noticed that a lot of grownups were shouting "gee" at horses and decided that "gee" was another name for "horse." Through the process of humorous alliterative "reduplication" often found in baby talk ("kitty-cat," "bow-wow," et al. ), "gee" became "gee-gee." If you enjoyed this column, you should probably subscribe. Dear Word Detective: I am watching the Olympics, and I have begun to wonder, what is the origin of the use of "heat" to refer to a group of athletes competing against each other to see who moves on to the next round of competition? -- Wendy. Oh darn, I forgot to watch the Olympics again. I did watch one winter when I was about twelve, and have been meaning to tune in again, but I've been really busy. Then again, given how many activities have become officially recognized "sports" in recent years, maybe I'll just wait until the Olympics come to my house. A bronze medal in Cat Wrangling is a slam dunk for me, and I'm definitely a contender for the gold in Extreme Procrastination. "Heat" is one of those English words that describe things so central to life that they have taken on a fairly amazing range of meanings, both literal and figurative. The word "heat" itself is, as you might imagine, very old, dating back to the ancient Germanic ancestor of English. "Heat" (from the root "khaitin") was formed as an abstract noun from the root of our modern "hot" (khaitaz"), expressing the basic meaning of "the quality of being hot" or "warmth." Over the centuries "heat" in English has been used to describe everything from chemical reactions to a rash on the skin ("prickly heat"), as well as feelings ranging from passion to rage. "Heat" has also been used as underworld slang for "a gun" (as in "packing heat"), the pressure applied by the police ("But the word went out that the government heat was on," 1936), and the effects of alcohol or drugs ("The party is going big along toward one o'clock when all of a sudden in comes Handsome Jack Maddigan with half a heat on, and in five minutes he is all over the joint, drinking everything that is offered him," Damon Runyon, "Guy and Dolls"). In the 14th century, "heat" was also used to mean "a single intense effort or bout of action," most likely from the heating effects of such exertion. By about 1670, "heat" was used to mean the warm-up runs given to horses to prepare them for a race, and at about the same time "heat" also came into use meaning "a single course in a race or other contest," or a single contest in a series. Thus the modern athletic sense of "heat" was born from the sweat of horses. My cats think you should subscribe. Dear Word Detective: I recently came across an unfamiliar word, "scoleric," which I was subsequently unable to find in any dictionary. From the context, it appears to be a close relation to "sclerotic" in its metaphorical sense, but I would like to nail its meaning down more precisely, and get a better idea of its etymology. (Perhaps it's related to the Greek "skolios," meaning "twisted," or "crooked"? At any rate, that's the best I could come up with.) Here is the passage where I initially encountered it: "I guess what I'm really trying to say that if we're rebelling against anything ... it's exactly the self-serious stewards and credulous oxymorons of American Literature (I prefer "American Letters") who can't see the scoleric, entirely pretentious nature of the art and its industry and wouldn't know irreverence if it came over and bit him in the cloister." A Google search turned up a few other instances where the word is used in a similar sense, e.g., "scoleric industrial policies." All of these sources use the word as if it were already well-established and common. Can you help clarify its origin and meaning? -- Matthew Humphrey. Good question, but brace yourself for a disappointing answer. I don't usually make blanket pronouncements, being a hippie-dippy relativist by nature, but what we have here is a mistake. "Scoleric" does not exist -- not yet, anyway, although if enough monkeys at enough keyboards keep typing it, someday it will. But at the moment there are only nine unique Google hits for "scoleric," mostly from blogs and internet mailing lists. The one "old media" occurrence on Google is from the web log at The Washington Monthly, but that particular writer isn't the brightest bulb on the porch in the first place, so I'm not surprised. It's very likely that the word all these writers had in mind was, as you suspected, "sclerotic," which, in a figurative sense, means "rigid, unchanging, antiquated." In a literal sense, "sclerotic" means "afflicted by sclerosis," sclerosis being a morbid hardening of any tissue or body structure. Sclerosis is a nasty business. Arterial sclerosis (often called "hardening of the arteries") and multiple sclerosis (hardening and destruction of nerve tissue) are both serious diseases. "Sclerosis," first appearing in English in the 14th century, comes from the Greek "sklerosis" ("hardening"), based on "skkeros," meaning "hard." Interestingly, a relative of "skleros," the verb "skellein" ("to dry up"), produced the Greek idiom "skeleton soma" ("dried up body," or mummy), which became our English "skeleton." It is also possible, perhaps likely, that "scoleric" is an impromptu blend of "sclerotic" with the adjective "choleric," meaning "irritable, bad-tempered, easily angered." That would make "scoleric" mean, I suppose, "rigid and irritable." If you really liked me, you would subscribe. Dear Word Detective: Listening to the news the other day I heard a word used I've heard a thousand times but only understood it in terms of its context. The word is "staunch" as in "He is a staunch advocate of civil rights," for instance. Upon looking up the word, it has two meanings: "to stop the flow" of something, or to be "steadfast and true." I guess these two meanings can be related if one imagines a dam being steadfast and stopping the flow of water but the current usage seems to imply support, not stopping anything. Am I quibbling? -- Scott Jackson. Feel free to quibble. As Mark Twain once said, the difference between the right word and the wrong word is the difference between a butterfly and butter. Or maybe it was a horsefly and a horse. Lightning and a lightning bug. Whatever. He probably never really said it anyway. But you get the idea. If there are two wildly differing meanings of "staunch" running around out there, people have a right to know the truth. "Staunch" does indeed have the two meanings you mention. On the one hand, it means "to stop the flow" of something. Today it is most often used in a literal sense to refer to blood, but figuratively it can be applied to any continuous process deemed undesirable, such as the loss of jobs to "offshoring." 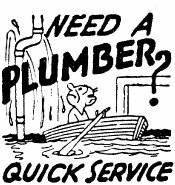 This sense is very close to that of its root, the Old French "estancier," meaning "to stop the flow of a liquid" or "to make watertight." The other meaning of "staunch" is "standing firm to one's principles; determined," often applied to political or philosophical affiliation ("As a staunch vegetarian, I refuse to shake hands with anyone named Arby."). The logical connection to "estancier" is through its original meaning in English, "watertight," which later came to mean "of firm construction; solidly built." The second bit of good news is that today the two words are almost always spelled differently. The verb is usually spelled "stanch," and the noun is spelled "staunch." I've used the "staunch" spelling all through this column, but in the real world the difference in spelling makes it fairly easy to tell what meaning is meant. All contents Copyright © 2006 by Evan Morris.